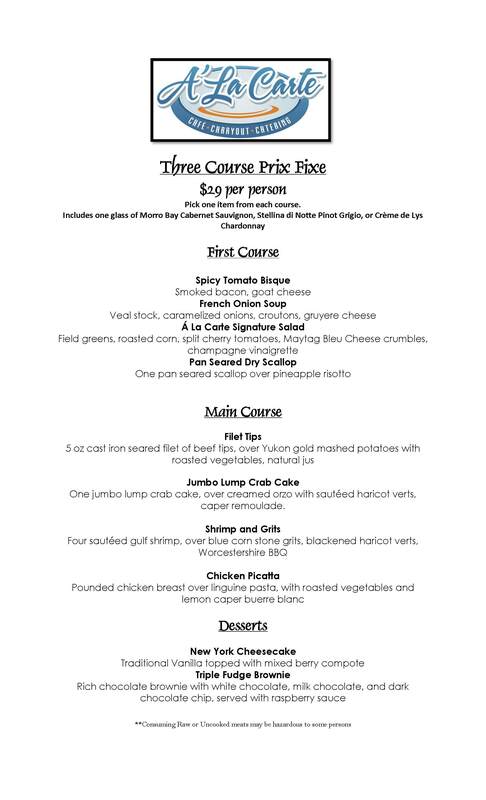 Starting this weekend, we will be offering a 3 Course Prix Fixe Menu at Dinner. Patrons will receive 3 courses and a glass of house red or white wine for $29. It is available from 5 pm – 6:30 pm, Thursday – Saturday. The regular dinner menu will still be available, but this is a great economical option for diners that are looking for a deal and need to watch their wallets. This entry was posted on Monday, June 20th, 2011, 2:13 pm and is filed under A La Carte, Restaurants and Dining, Uptown Station News. You can follow any responses to this entry through RSS 2.0. You can leave a response, or trackback from your own site. A La Carte is always doing fun and new things with their menu! I love it! Wonderful place to relax and enjoy a nice meal consisting of fresh wonderful ingredients, and served by an outstanding and caring staff! I cant wait to dine at A La Carte again this weekend! I’d be all over this deal for dinner tonight- but it’s Sunday, darn!